Try this before the peach season is over. It’s perfect for company, because you can prepare the tart in advance. Freeze it unbaked and then simply turn the oven on and bake it when it’s time. Your house will smell like a bakery and you will be relaxed and able to savor every bite of this scrumptious tart. Put all the dry ingredients (flour, sugar, ginger, salt) in a food processor or in a bowl. Cut the chilled butter into small pieces and add to the flour. Turn on the food processor or crumble the butter into the flour mixture until it resembles coarse sand. Add the cold water and mix only until combined. Flatten the dough and wrap in plastic wrap. Cool in the fridge for 20-30 min or until ready to use. You can also freeze the dough at this point and use at another time. Grab the dough from the fridge (thaw first if it’s been in the freezer)and roll into a round app 10″/ 25 cm in diameter. Remove the pit from the peach(es) and cut into slices, then put in a small bowl. Drizzle with the sugar and flour. Cut the marzipan into bites and spread in the center of the dough, then layer the peaches on top, leaving a 2″ /5 cm border all around. Divide a few dots of butter over the peaches and then fold the edge of the dough up and over the peaches. See photo. At this point you can choose to wrap the tart in plastic wrap and freeze it a few days. Bake for 40-45 min or until the crust is light golden. Dust with powdered sugar when slightly cooled. Try substituting the peaches with apples. Use cinnamon in place of ground ginger in the dough. Throw some chopped walnuts over the apples and dust with cinnamon sugar before baking. This entry was posted in Sweets and tagged apple marzipan tart, fersken marcipan dessert, fersken tærte opskrift, peach marzipan tart, rustic peach tart, tærte med fersken, æbletærte med marcipan. Bookmark the permalink. Det ser dælme godt ud!! 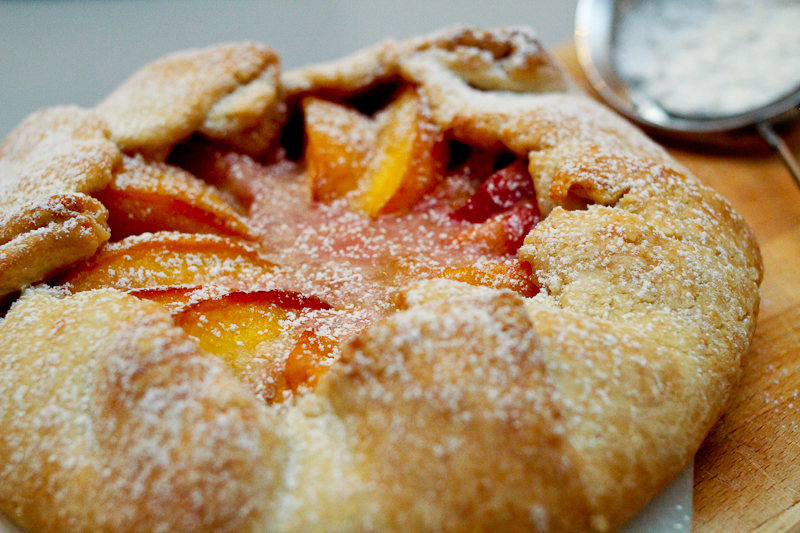 A yummy peach tart is just what the fall weather ordered…I’m doing this and adding a peach-cream cheese base. YUM!